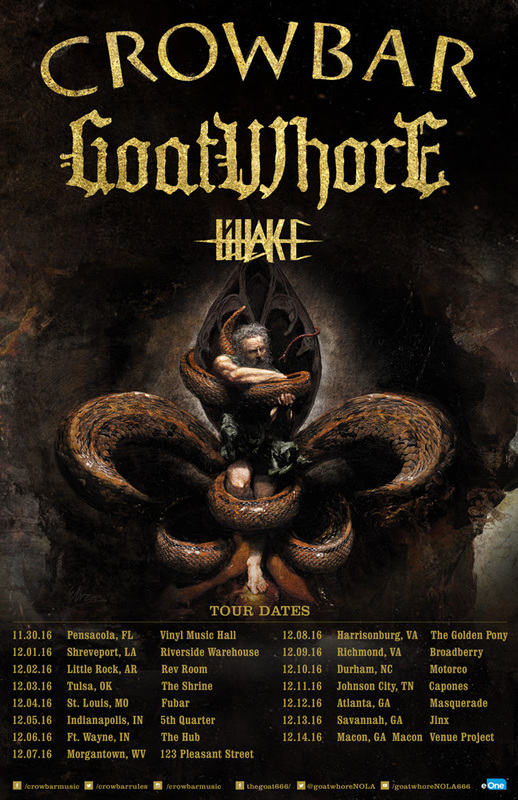 GOATWHORE Kicks Off Co-Headlining Tour With Crowbar; Additional Shows Announced – Ouch That Hertz! (November 30, 2016) – New Orleans’ most-toured metal unit GOATWHORE will kick off their final live takeover of the year with hometown comrades, Crowbar, tonight November 30th. The co-headlining trek will begin in Pensacola, Florida and run through December 14th in Macon, Georgia. Support will be provided by Lillake. From there, GOATWHORE will play three more headlining shows in Florida in Winter Park, Fort Lauderdale, and Tampa respectively before heading home for the holidays. The band’s latest excursions follows their recent US mini tour with The Blood Royale which included a pulverizing performance at Ozzfest in San Bernardino, California. GOATWHORE recently completed tracking the follow-to their globally adored Constricting Rage Of The Merciless full-length at Earth Analog recording studio near Champaign, Illinois. Further details to be unveiled in the coming weeks! It’s been sixteen years since Goatwhore reared its menacing head from the swamplands of New Orleans, Louisiana – a city rife with urban tales of voodoo curses, witchcraft and hauntings by souls of the damned. Spawned by former Acid Bath/Crowbar guitarist Sammy Duet in 1997, their winding legacy follows a dramatic, at times traumatic, sequence of personnel changes, fatal injuries, paranormal activity, natural disasters, and a collection of other misadventures large and small. They say what doesn’t kill you… whether driven by an unwavering commitment to their craft, pure insanity, the divine powers of Satan or perhaps a combination of the three, Goatwhore forever perseveres, inadvertently establishing themselves as one the hardest working, consistently punishing live bands of the 21st century and a true institution of heavy music.